Indonesia is a geographic mixing point between the traditional Malay peoples of most of Southeast Asia and the Austronesian peoples to the east. The country’s territory stretches thousands of miles from east to west and has a centuries-old history of settlement and interaction with the region and rest of the world. Consequently its culture and society reflect influences from China, India, the Middle East, and other areas of Southeast Asia. Indonesians have adopted a mix of traditional Asian values along with the particular practices of each ethnic group. Many of the customs, gestures, and values (called adat) are similar for each ethnic group, even though they may have a different origin. Most Indonesians, regardless of ethnic group, share a respect for tradition and culture, close ties and obligation to one’s family, and a respect for hierarchy, which translates into deference to age and education. 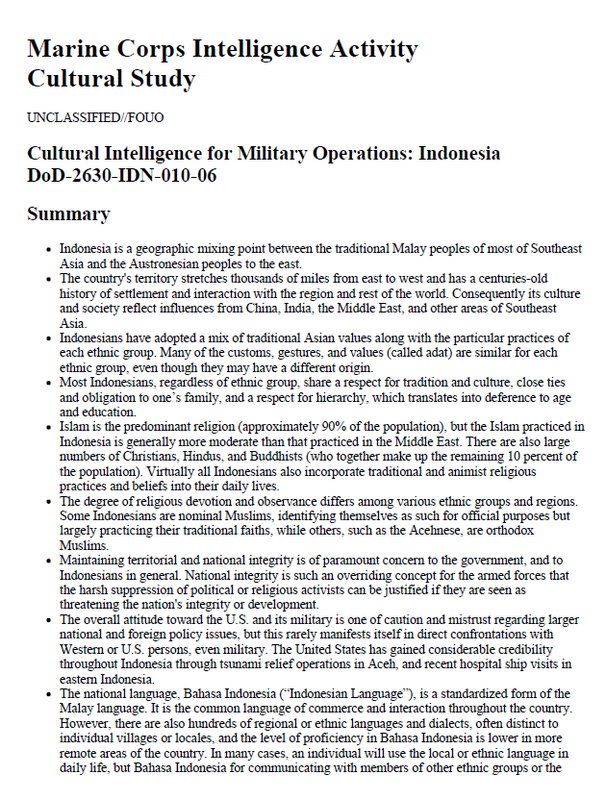 Islam is the predominant religion (approximately 90% of the population), but the Islam practiced in Indonesia is generally more moderate than that practiced in the Middle East. There are also large numbers of Christians, Hindus, and Buddhists (who together make up the remaining 10 percent of the population). Virtually all Indonesians also incorporate traditional and animist religious practices and beliefs into their daily lives. The degree of religious devotion and observance differs among various ethnic groups and regions. Some Indonesians are nominal Muslims, identifying themselves as such for official purposes but largely practicing their traditional faiths, while others, such as the Acehnese, are orthodox Muslims. Maintaining territorial and national integrity is of paramount concern to the government, and to Indonesians in general. National integrity is such an overriding concept for the armed forces that the harsh suppression of political or religious activists can be justified if they are seen as threatening the nation’s integrity or development. The overall attitude toward the U.S. and its military is one of caution and mistrust regarding larger national and foreign policy issues, but this rarely manifests itself in direct confrontations with Western or U.S. persons, even military. The United States has gained considerable credibility throughout Indonesia through tsunami relief operations in Aceh, and recent hospital ship visits in eastern Indonesia. The national language, Bahasa Indonesia (“Indonesian Language”), is a standardized form of the Malay language. It is the common language of commerce and interaction throughout the country. However, there are also hundreds of regional or ethnic languages and dialects, often distinct to individual villages or locales, and the level of proficiency in Bahasa Indonesia is lower in more remote areas of the country. In many cases, an individual will use the local or ethnic language in daily life, but Bahasa Indonesia for communicating with members of other ethnic groups or the government. English proficiency declines dramatically outside urban areas, with virtually no English capability in rural villages. Though Indonesians are predominantly Muslim, Arabic is not commonly used in the region except in the most orthodox Muslim provinces. hands, it is usually at her initiative. It is polite to bow slightly when meeting elderly or senior-ranking individuals and wait for them to initiate the handshake. and polite to give and receive the cards using both hands, and to keep the card out for the duration of the meeting. Common English greetings are generally acceptable and understood by most Indonesians in urban areas. slightly less formal, so Juwono also could be called “Pak Juwono.” Ladies are addressed as “Ibu,” or the less formal “Bu,” meaning “mother,” and the usage is the same as that of “bapak.” “Ibu” and “Bu” do not differentiate between a married and unmarried woman.